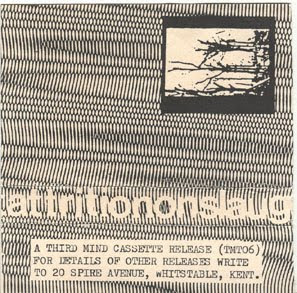 From Discogs: ""Forever there will be the speculation that the exploration of darkness as a beautiful place will lessen our fear of it all, ease the pain a little..."
Attrition, from Coventry, England, began in the early 1980s with founder Martin Bowes. This group has garnered a loyal following because of their ability to merge the electronic, darkwave and classical forms into something their own. Attrition's sound is strongly based on contrasts. There are gothic tracks that incorporate violas, ethereal tracks that contain Martin's gritty vocals, and danceable electro pieces that use orchestral arrangements. Recent tracks have even brought in a member of the Paris opera, Franck Dematteis, giving the music yet another unusual twist." This is one of their earliest releases and is melancholic and electronic, a forecast of their later work, I guess. Dr. Freakowitz handed this in, but I realized I had a copy myself. Huzzah! My friend, my liege Martin! Thirty years and still at it.